In Mexico, a country with deep-rooted Christian traditions, the Holy Week is a national holiday, with all schools and many public and private companies closed during those day. 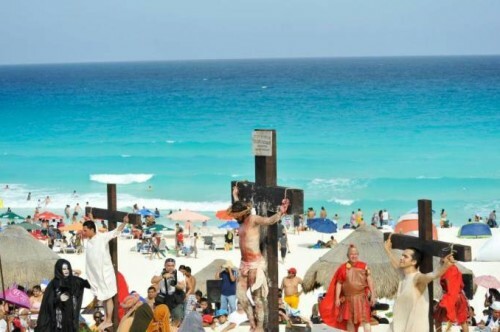 Holy Week (Semana Santa) is a very important religious observance, as well as an important vacation period here in Mexico. It is preceded by other observances such as Lent (Cuaresma) and Carnaval (Carnival). Holy Week begins properly on Palm Sunday (Domingo de Ramos) and historically, this is the day according to the Gospels that Jesus arrived triumphantly into Jerusalem on the back of a donkey ! Semana Santa is the beginning of the Easter festivities with masses held at the Iglesia de San Miguel and also at the Iglesia de Corpus Christi. These masses are followed by candelit vigils and the burning of the model of Judas. On Easter Sunday the church altars are filled with flowers and the streets are decorated in preparation for the Easter parade. In the Plaza Central de San Miguel de Cozumel the people gather for fun and music and the children have the tradition of cracking eggs filled with confetti over each others heads. If you are fortunate enough to be here during these festivities make sure you make some time to join the locals and soak up some of Cozumel´s age old traditions. We can guarantee you will enjoy yourselves during Semana Santa in Cozumel.